hibiscus flower jelly | eating with S.O.L.E. My mother in law arrived for her second visit in the past month, and after making strawberry jam last time, she was ready to get back into the kitchen for another adventure in canning! We had planned to finally use up the grapes in the freezer from last years harvest.. but the thought of dripping and straining them left something to be desired at 8 pm, so we opted to make a batch of hibiscus jelly instead… and what a wonderful decision it was. 1 cup of hibiscus flowers in it, for about 20 minutes. strain the flowers, and add about 1/2 cup lime juice. We used pomona’s pectin again for this batch (it’s my new favourite) it has and added step of calcium water but makes for a lovely low sugar pectin. 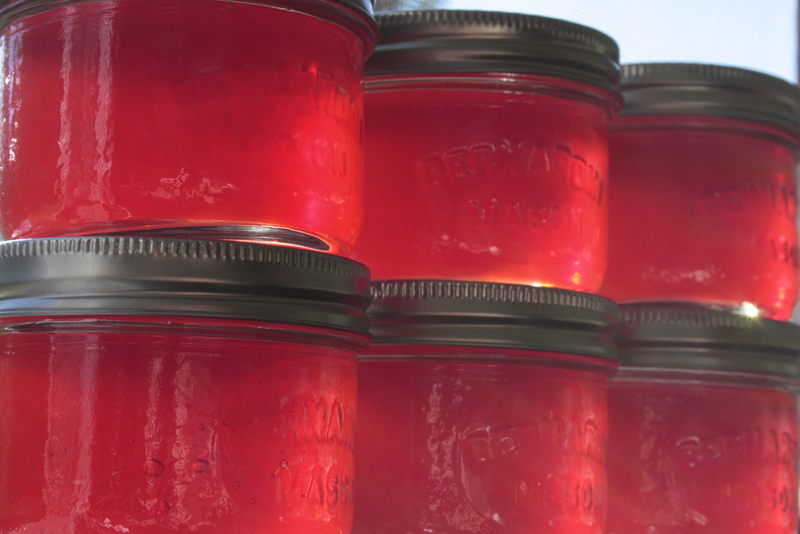 once boiled and skimmed, we processed the jars or 10 minutes in a steam canner, and yielded 14 jars of the prettiest pink jelly you ever did see! It has a mild floral flavour and a not to sweet presence. It’s perfect for scones and shortbread, or simply to slather on a PB sandwhich.